I’m on record being lukewarm towards the majority of Telltale’s second stab at Dark Knight drama. Prior to Episode 4: What Ails You, the season didn’t seem to have anything up its sleeve besides unresolved tension and one or two canon inversions per episode. I even stated that despite the brisk, satisfying action of What Ails You, it wouldn’t be able to redeem the entire season. But that assertion was made with the expectation that the season finale would merely stay the course at best or drop back down to mediocrity at worst. 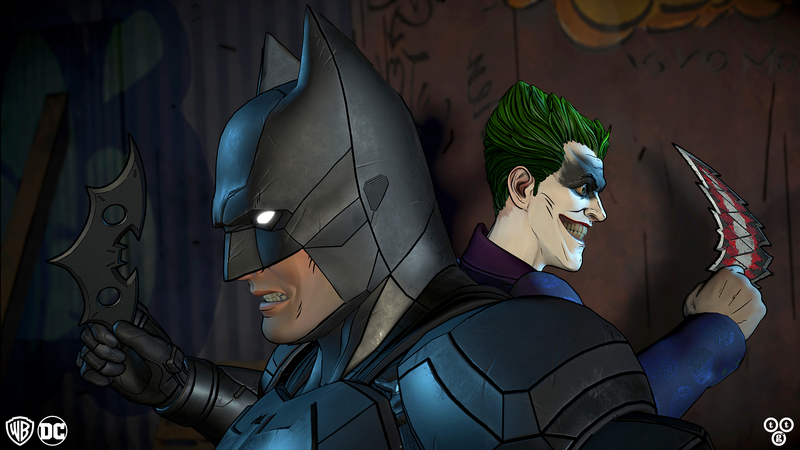 Instead, Batman: The Enemy Within – Episode 5: Same Stitch became the best part of the season, and the best single chapter in Telltale’s catalogue in over a year. Most importantly, Same Stitch doesn’t just ride the momentum of its predecessor; it pushes it farther than ever. Compared to the slow boil that was episodes 2 and 3, the action here is downright explosive, buoyed by some of the most powerful voice performances in recent memory and a huge divide in the nature of the antagonist based on previous player decisions. That last point that been the focus of the marketing, and with good reason: Joker’s unusual emergence resolves four episodes worth of build-up and leads to a deservedly climactic showdown. And for those already rolling their eyes at the idea of the Joker highjacking the plot of a Batman story again, Telltale has foreseen such a reaction. While the Joker is the final adversary, to say he highjacks the plot is to do the plot a disservice. In particular, an early-to-mid-episode setpiece battle is such an engrossing flurry of alliances and motivations that it’s enough to remind everyone why this character-juggling style of adventure game caught on in the first place. As a bonus, it also demonstrates why I never put too much stock in the “too many villains” criticism the previous episodes were often slapped with. The story as a whole is adept at hitting both emotional highs and lows. There are several unexpected moments that are honestly laugh-out-loud funny, contrasted by some of the most gut-wrenching choices Telltale has ever devised. There’s still a fair distance between here and perfection, but most of the things comprising it are endemic to the series as a whole and couldn’t be fixed with an individual episode. The controls and quick-time events are all functional now, but they’re still unintuitive and unimmersive, with the new worst examples of such being a pair of self-administered medical procedures accomplished with mere disinterested swipes of the mouse. The few attempts at puzzles feel a lot less token than in the past, though there’s still a whopping zero amount of challenge to any of them, so they’re still not the most the worthwhile inclusion. The series’ reliance on screwing with Batman tradition returns as well, bringing with it the strangest relationship that any episode has yet had with the concept. To wit, my instinct upon completing Same Stitch was to say it succeeded despite this limitation, only to immediately remember that the limitation was self-inflicted. The diversions from the source material this time around are so extreme, and the final choices and twists are so guaranteed to pull the rug out from under fans’ feet, that they almost distract from the developer’s stubborn refusal to add anything else to its recipe. But the lasting impression is simply of a one-trick pony whose one trick happens to be more multifaceted than usual. I hate to eat my words, but it’s actually possible that the one-two punch of episodes 4 and 5 does save the entire season. I’ve always appreciated the idea of Telltale’s adventure games – I like that they focus on the things the genre excels at and don’t waste our time with the chaff it picked up over the years, and the company can usually be relied upon to craft striking audio and visual displays. But while that makes for a strong baseline, new titles still need a reason to exist and/or superb execution to be worth playing. Batman: The Enemy Within – Episode 5: Same Stitch is still searching for the former, but it nails the latter, retroactively making a surprise recommendation out of The Enemy Within as a whole.